Nearly every source of information about Parental Alienation from books to the internet will tell you lots about this insidious psychiatric disorder, however very few will suggest proactive approaches to assertively deal with the problem such as this website. 'Parental alienation is the process, and the result, of the psychological manipulation of a child into showing unwarranted fear, disrespect or hostility towards a parent or other family members. It is a distinctive and widespread form of psychological abuse and family violence towards both the child and the rejected family members that occurs almost exclusively in association with family separation or divorce (particularly where legal action is involved) and that undermines core principles of both the Universal Declaration of Human Rights and the United Nations Convention on the Rights of the Child. Most commonly, the primary cause is a parent wishing to exclude another parent from the life of their child, but other family members or friends, as well as professionals involved with the family (including psychologists, lawyers and judges), may contribute significantly to the process. It often leads to the long-term, or even permanent, estrangement of a child from one parent and other family members and, as a particularly adverse childhood experience, results in significantly increased risks of both mental and physical illness for children'. This definition is published on Wikipedia alongside other key relevant information. Psychologist Dr Richard Warshak also presents an excellent overview of Parental Alienation on his website. The most defining feature of an Alienated Child is they almost always (nearly 100 %) call the Targeted Parent by some other name other than mum or dad. It will usually be that parents first name. If there are step parents they will almost always refer to them as mum or dad. Dr Craig Childress referred to this in his slides at the 2017 Symposium in Dallas. Psychiatrist Richard Gardner became aware of the phenomena from doing family assessments for divorcing families during the introduction of 'No Fault' divorce in the USA in the 1970's and was one of the first to publish extensively and actively campaign against Parental Alienation. It can be perpetrated by either gender however it usually only takes hold if the Alienating Parent is caring for the child in a major way such as joint custody or sole custody. It starts off with the Alienating Parent saying negative things to the child about the Targeted Parent. It progresses to a campaign of denigration about the Targeted Parent. The power of an Alienating parent to brainwash a young child during their formative years is considerable. They provide food, shelter and emotional support and can reinforce the negativity about the targeted parent for most of the child's waking life outside of time spent at school and with friends. The child has a natural disposition to want to think good things about both parents however when they hear so much negativity they retreat to psychological splitting where one parent is perfect and the other is so bad they can be seen as demonic. Once this happens, Parental Alienation Syndrome (PAS) is said to have taken place. The next stage is where the child becomes triangulated in the dispute and joins in as a spy, gathering information on the Targeted Parent. If the disorder continues to evolve, the next stage is the child parroting false allegations of abuse against the Targeted Parent. In extreme cases the child will physically harm the Targeted Parent. In moderate to severe Alienation there is role reversal known as Parentification between the parent and the child and the child becomes the protector. The Alienator shares information about all their adult issues in life and the child becomes a confidant. The Alienation 'enmeshes' the child with the Alienator and can be lifelong and prevent the child from ever having an independent life away from the Alienator. A number of psychologists have expressed that the mind control over the child is similar to the control a cult leader has over the minds of its members. One Targeted Parent and Psychologist mother has surveyed what she feels are the primary 23 cult-like techniques an Alienating Parent uses to brainwash their children. 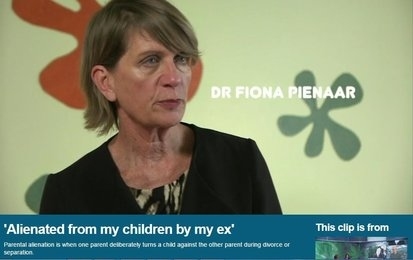 Dr Alexandra Stein produced the video below which gives a good overview about cult behaviours which are very recognisable in Parental Alienation. Alienating parents think that denigrating a child's other parent raises them in the eyes of the child, however what it does is lower the feeling of self worth of the child because the child sees themselves as ½ of the other parent. This feeling of low self worth has a negative psychological effect on the child that can manifest itself in a lot of psyschological problems. The disorder is in the Beta Draft for International Classification of Diseases version 11 by the World Health Organisation dated 7th of April 2017. Despite Parental Alienation coming under the definition of 'Family Violence' in the Australian Family Law Act of 1975 and other legislation, few if any people report it. Mostly due the low level of awareness of the problem by professionals. All 'Family Violence' is required under law to be reported by specified professionals. Failure to do so can result in penalties of up to $ 10,000 to them. The main standard of assuredness that 'Family Violence' is in occurrence has been specified is 'on reasonable grounds' although it varies from state to state and various legislation. Due to the pre-occupation by our political leaders with the primacy of allegations of sexual and physical abuse it is extremely difficult to get claims of Parental Alienation taken seriously by the Government. To get the Government to take notice of and give concern to any claim of Parental Alienation reported, the report needs to be 'Gold Standard', whereas the most whimsical claims of sexual and physical violence reported by the initial complainant are met with a rapid and forceful response. Parental Alienation is intermeshed with parents who abduct their children like the case of the Vincenti sisters. An alternative approach to the theoretical underpinnings of Parental Alienation by Dr Craig Childress is that due to psychological inadequacies of one parent, that parent works to achieve switching the parent/child roles with the child and the child is used as a regulatory object to meet the emotional and psychological needs of the parent. The Alienating Parent does this with boundary violations such as sharing adult and spousal conflict information with the child. This breaks the attachment bonds the child has with the Targeted Parent. This is extremely traumatic for the child because a child is born with a built in programming to maintain the support of both parents to protect them from predators. Another approach to understanding Parental Alienation is that the child in order to escape being in the middle of parental conflict joins in with the Alienating parent to crush the Targeted Parent out of their life. Information about Parental Alienation by Psychologist Richard Warshak. Alienated child with Justice Harvey Brownstone. The assistant director of the UK's Children and Family Court Advisory and Support Service Cafcass, Sarah Parsons, has stated that: “Parental alienation is responsible for around 80% of the most intransigent cases that come before the family courts. A study by Bala, Hunt and McCarney found that out of the 175 Canadian cases analysed between 1989 and 2008 that Parental Alienation was concluded to have occurred in approximately 60 % of the cases. An Australian study by Dr Berns from the University of Queensland found Parental Alienation to be present in 29 % of a sample of cases from the Brisbane Registry of the Family Court for the period 1995 to 2000. The difference could be explained by the fact that Parental Alienation had much greater recognition at the time by professionals in Canada than Australia. Dr Lorandos has published an excellent review of the various studies of the incidence of Parental Alienation on the Lorandos Law website. Now recognised in the UK as child abuse and to be acted upon by Cafcass from Spring 2018. The UK's Children and Family Court Advisory and Support Service (Cafcass) has acknowledged that the deliberate manipulation of a child by one parent against another during and after divorce/separation is harmful and will be acted upon by the Agency. From Spring 2018 Cafcass Guidelines will spell out when children should be removed from an Alienating Parent and placed in the care of the Targeted Parent. Parental Alienation has been outlawed in Brazil, Mexico & Romania.